NAIROBI, Jul 6 2018 (IPS) - Joshua Kiragu reminisces of years gone by when just one of his two hectares of land produced at least 40 bags of maize. But that was 10 years ago. Today, Kiragu can barely scrape up 20 bags from the little piece of land that he has left – it measures just under a hectare. Kiragu, who is from Kenya’s Rift Valley region, tells IPS that years of extreme and drastic weather patterns continue to take their toll on his once-thriving maize business. His business, he says, has all but collapsed. But Kiragu’s situation is not unique. Effects of land degradation and desertification are some of the major challenges facing smallholder farmers today. “Population pressures have led to extreme subdivision of land, farms are shrinking and this affects proper land management – smaller pieces of land mean that farmers are overusing their farms by planting every year,” says Allan Moshi, a land policy expert on sub-Saharan Africa. Statistics from the Food and Agricultural Organization of the United Nations (FAO) show that a majority of Africa’s farmers now farm on less than one hectare of land. “This is the case for Zambia where nearly half of the farms comprise less than one hectare of land, with at least 75 percent of smallholder farmers farming on less than two hectares,” Moshi tells IPS. Although smallholder farmers contribute to land degradation through poor land management, experts like Moshi are concerned that local farmers remain at the periphery of efforts to address the impact of desertification. “Their exclusion will continue to limit how much success we can achieve with ongoing interventions,” he adds. Moshi says that the situation is dire as small-scale farmers across Africa account for at least 75 percent of agricultural outputs, according to FAO. In Zambia, for instance, over 600,000 farms with an average land size of less than a hectare produce about 300,000 metric tonnes of maize. While this production meets the food needs of the country’s 17 million people, they lack modernised irrigation systems, making their crops vulnerable to drastic weather changes when they occur. Reckson Matengarufu, an agro-forestry and food security expert in Zimbabwe, says that in the last decade Zambia has joined a growing list of countries characterised by a rainfall deficit, a shortage of water, unusually high temperatures and shrinking farmlands. “These are also countries that have signed and ratified the United Nations Convention to Combat Desertification (UNCCD) that aims to fight desertification and address the effects of drought and particularly threats to food security from unusually high temperatures,” Moshi explains. But Matengarufu emphasises the need for countries to build the capacity and understanding of small-scale farmers about transformative efforts. “There is a need to introduce agro-forestry, whereby farmers integrate trees, crops and livestock on the same plot of land, into discussions on food and nutrition security,” he says. According to a UNCCD report ‘Investing in Land Degradation Neutrality: Making the Case’, in Zimbabwe alone more than half of all agricultural land is affected by soil degradation. And in Burkina Faso, approximately 470,000 of a total 12 million hectares of agricultural land are under the looming cloud of severe land degradation. Experts like Mary Abukutsa-Onyango, a professor of horticulture at the Jomo Kenyatta University of Agriculture and Technology in Kenya, are raising the alarm that desertification is rapidly reducing the amount of land available for agriculture. Agro-forestry experts are increasingly encouraging farmers to incorporate integration efforts “so that they can benefit from the harvest of many crops and not just from planting maize on the same plot each year,” says Matengarufu. Abukutsa-Onyango adds that the poor seed system in Africa has made it difficult for farmers to cushion their land from further degradation. Research shows that for sub-Saharan Africa to improve production there is a need to overhaul the seed system and for the average age of commonly-grown seeds to drop from the current 15 to 20 years to below 10 years. “Farms are rapidly losing their capacity to produce because they save seeds from previous harvests, borrow from their neighbours or buy uncertified seeds from their local markets. These seeds cannot withstand the serious challenges facing the agricultural sector,” Abukutsa-Onyango says. In countries like Kenya, Malawi and Zimbabwe farmers receive at least 90 percent of their seeds from the informal sector. Research from the Alliance for a Green Revolution in Africa (AGRA) shows that on average only 20 percent of farmers in Africa use improved variety seeds. “For African countries to achieve food and nutrition security, farmers must have access to high-yielding varieties that are designed to adapt and flourish despite the high temperatures and erratic weather we are experiencing,” Abukutsa-Onyango says. Within this context, AGRA decries the fact that there are still very few local private seed-producing companies across Africa. AGRA continues to push for more of these companies. The alliance has contributed to the rise in local seed companies across sub-Saharan Africa, excluding South Africa, from a paltry 10 in 2007 to at least 10 times that by 2018. 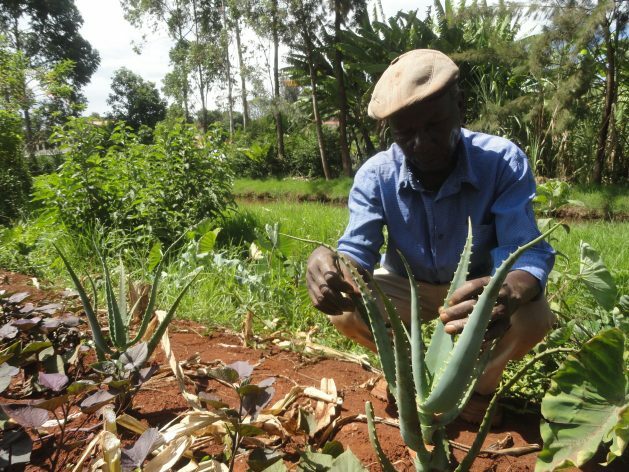 Experts emphasise that on average the use of improved seeds and proper farming practices will enable farmers to produce more than double what they are currently producing. Moshi nonetheless says that the battle to combat the effects of drought and desertification is far from won. He decries the exclusion of local communities and the general lack of awareness, particularly among farmers, on the connection between poor land management and land degradation. “We also have divided opinions among stakeholders and experts on effective strategies to combat desertification, financial constraints and in many countries, a lack of political goodwill,” he concludes.